In Donald Rumsfeld’s new book, Known and Unknown, out February 8, Rumsfeld offers an account of George W. Bush’s early interest in Iraq. This was just days after the 9/11 attacks. There were no apparent reasons for Bush to focus on Iraq, instead of on the actual perpetrators of the attacks. Just 15 days after the terrorist attacks of Sept. 11, 2001, President George W. Bush invited his defense secretary, Donald H. Rumsfeld, to meet with him alone in the Oval Office. According to Mr. Rumsfeld’s new memoir, the president leaned back in his leather chair and ordered a review and revision of war plans — but not for Afghanistan, where the Qaeda attacks on New York and Washington had been planned and where American retaliation was imminent. 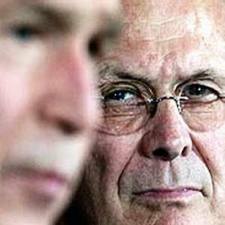 “He asked that I take a look at the shape of our military plans on Iraq,” Mr. Rumsfeld writes. When the option of attacking Iraq in post-9/11 military action was raised first during a Camp David meeting on Sept. 15, 2001, Mr. Bush said Afghanistan would be the target. But Mr. Rumsfeld’s recollection in the memoir, “Known and Unknown,” to be published Tuesday, shows that even then Mr. Bush was focused as well on Iraq. What Rumsfeld seems to be saying, without saying it explicitly, is hugely important: that Bush’s rush to war with Iraq seemed to make no sense. More than that, it was downright fishy. Rumsfeld suggests that Bush had some kind of prior agenda that had nothing to do with any role Iraq might have had (and in any case did not) in the events of 9/11. Bush simply wanted to invade that country. If so, why? Rumsfeld apparently doesn’t speculate. But he doesn’t need to. Herskowitz said that Bush expressed frustration at a lifetime as an underachiever in the shadow of an accomplished father. In aggressive military action, he saw the opportunity to emerge from his father’s shadow. That opportunity, of course, would come in the wake of the September 11 attacks. “Suddenly, he’s at ninety- one percent in the polls,” Herskowitz said, “and he’d barely crawled out of the bunker.” Just four days before, according to a Gallup poll, his approval rating was 51 percent. Bush’s circle of preelection advisers had a fixation on the political capital that British prime minister Margaret Thatcher had amassed from the Falklands War with Argentina. Said Herskowitz: “They were just absolutely blown away, just enthralled by the scenes of the troops coming back, of the boats, people throwing flowers at [Thatcher] and her getting these standing ovations in Parliament and making these magnificent speeches.” It was a masterpiece of “perception management”—a lesson in how to maneuver the media and public into supporting a war, irrespective of the actual merits. What’s remarkable is that after all this time, news outlets such as the Times, and almost every other major corporate-owned news outfit, has simply ignored what is now a matter of public record. Herskowitz is no duffer. He is a longtime Texas newspaper columnist who has ghostwritten or co-authored several dozen books on major figures in politics and sports. He went on to write the authorized biography of Bush’s grandfather, at the invitation of Bush’s father. The family obviously trusted him. As far as I can tell, these news organizations have never been pressed to explain why they ignore this missing link into one of America’s biggest misadventures. So these news organizations have never pressed Bush to respond. And so he hasn’t. And there we are.